I have been going through my fabric stash a lot lately trying to match up patterns and fabrics that I already have together. Until recently most of my fabric and pattern purchases have just been “for the stash” and I haven’t really had a purpose or project in mind for them. On a fabric shopping trip I think at the start of last year or maybe it was even the year before I purchased some brown fabric that caught my eye due to unusual texture of it. 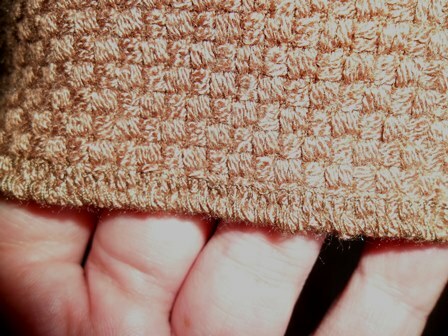 It feels like chenille so it has a cozy feel to it but it is very light and drapey. It just went in my stash. I have patted it a few times but never really thought of making anything with it. Earlier this month I was wanting a really simple mindless sewing project so I pulled it out of my stash and thought I would make a cape out of it using Burda 7313 like I made for Frocktails this year. 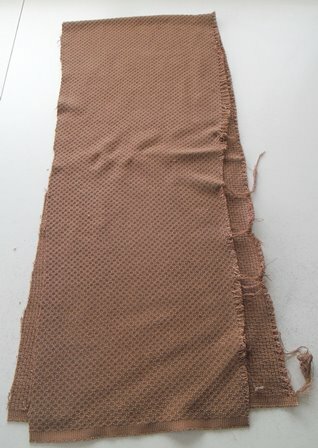 When I was washing my mind kept thinking I already have a couple of capes including a brown one which I am currently knitting. In my pattern stash I came across New Look 6287. I originally brought this pattern to make view A as I have some other fabric which is perfect for it. 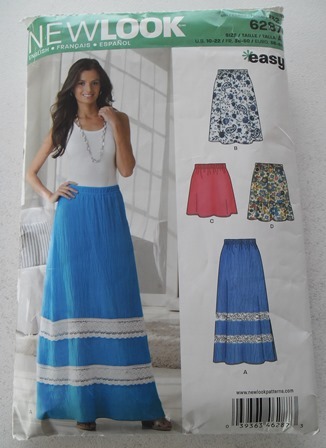 Needless to say I still haven’t made that perfect skirt but I was reading the fabric suggestions for the other skirts in the pattern and decided that I would have enough fabric to make view B. This pattern calls for a woven fabric and not a knit. I liked the picture of view B as it had a nice flow to it and I thought it would sit well with the fabric. As it is a little longer I thought it would be a good winter skirt. I have never made a New Look pattern so I wasn’t sure how their sizing is, I had heard they were on the smaller size of patterns. I did my measurements and went with the largest size as I needed it for my hips. Looking back now the waist is a little big so perhaps I should have graded down at the waist one size. I’m not too worried at how it looks with the largish waist, I never wear crop tops so you never see my waistband. It isn’t too big that it is falling off my either. I was worried it may be a bit snug at the hips but it has enough ease in the pattern to swish comfortably around me and not feel tight. I love the feel of the fabric it feels squishy. Even though it is a synthetic it doesn’t feel hot but I couldn’t wear this in summer unless I was in air conditioning the entire time but spring, autumn, winter I should be fine. Sewing wise it was a really simple sew. I made it in a day tracing and cutting it out in the morning and then sewing it in the afternoon. To be honest once I had cut it out I wasn’t sure if I was even in the mood for sewing it that day but it was a really relaxing make that didn’t have a lot of steps so I easily finished it. I decided to be a bit rebellious with the hem. I just overlocked the hem and didn’t turn it up. Because of the basket weave texture I think I can get away with something funky at the bottom and it doesn’t look odd. The skirt moved so fluid I was worried if I turned up the hem it might make it feel too structured. One extra thing I did different to the pattern was I had to piece my waistband as my fabric wasn’t wide enough to cut it in one piece. So it fails the natural fibre content but it ticks all the rest of the points. 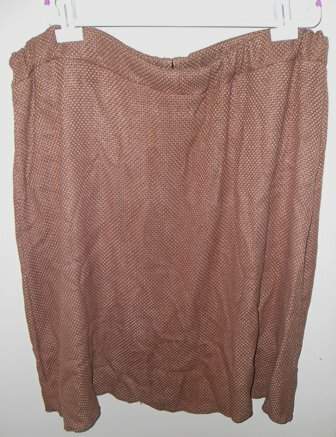 It is a simple skirt that is super comfortable and is made from an unusual fabric. 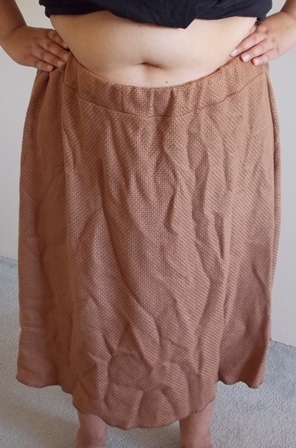 By using the fabric in this skirt I know I will get more wear out of it rather than had I made a cape. I will wear a skirt most days to work in winter so I am in need of warmer ones if I don’t want to repeat my skirts in the same week. « Ankle Socks – Attempt?